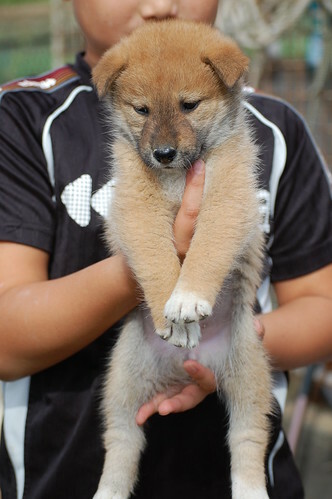 Since my schedule freed up a bit today, I made the trip down to my friend's kennel to look at the available litter of 5 female Shikoku. It was a beautiful autumn day, sunny, but with a nice crisp breeze. 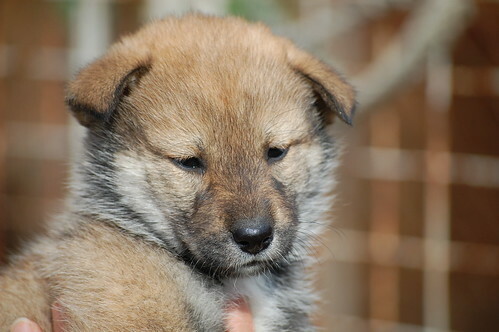 The pups all look to be in great health, 5 very friendly little furry girls. They all look very similar, and in coloration look like they'll be aka or aka-goma. They are predominantly red, with a bit of black tipping here and there. There is one darker female who looks like she may go more toward goma (the last picture). When I got there my friend's kids were out playing with the pups in the kennel, so I had them hold the pups for pictures. I've got close up pictures of them up on my flickr photostream http://www.flickr.com/photos/30674599@N04/ so feel free to take a look. There is another litter with two females that was born 3 weeks ago, but they're not ready to go yet, so I'll take pictures of them next time. One of the pups will be decided in the next few days, and it looks like whatever girls are not picked by the end of the month, are going to other kennels. If anyone is interested in these girls, fee free to mail me. 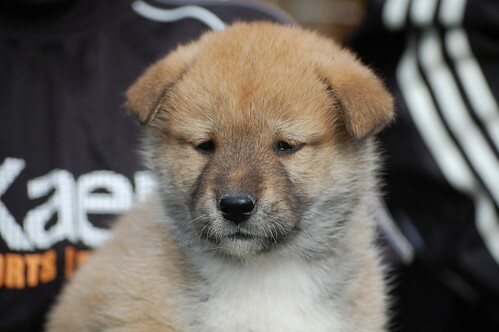 very nice puppies shigeru! 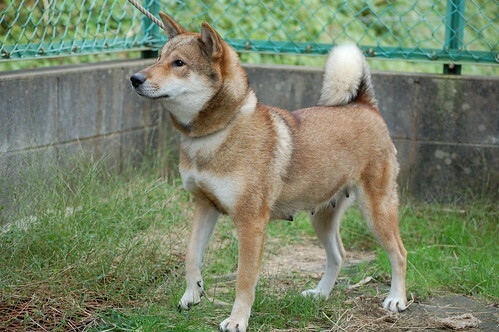 I like so much darker shikokus, they have an aspect more similar to wolf. 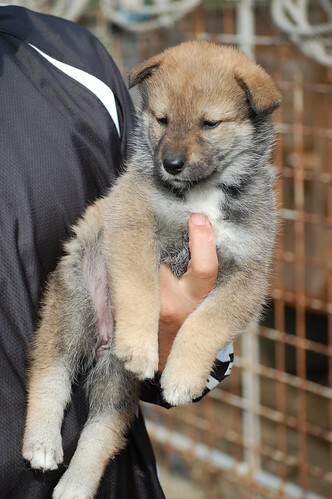 Hi, do you have more information about those puppies? (Like prize and the posibility of sending one of them to spain). Hi Shigure, I like the female 4a. 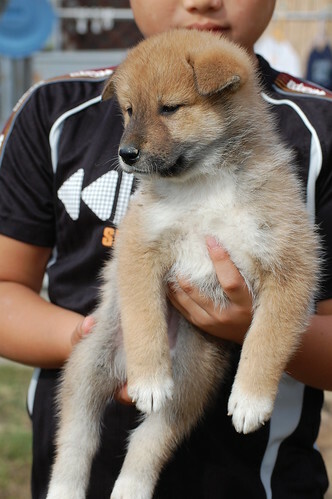 I'm a breeder of Shikokus and I live in Canada. Brad has two of my girls. I'll e-mail you private. 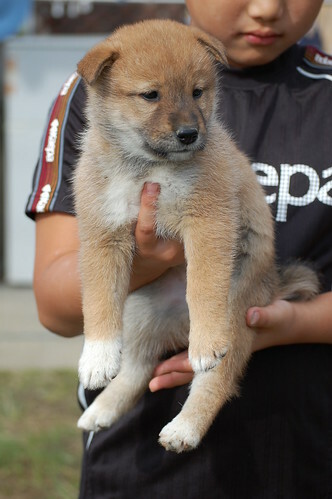 i live in belgium, and i am looking for a shikoku pup, here in belgium we cant find shikoku pups.. i like the bottom pup, with the most grey. but what's the price? and where do you live? 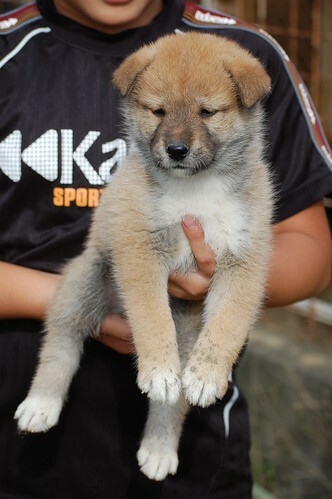 would there be a possibility to ship the pup in any way to belgium?